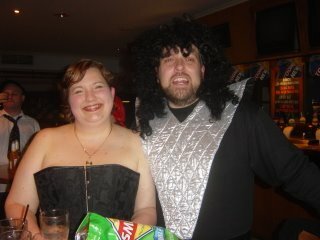 I went to a fancy dress karaoke party on Saturday night, the theme was Rock! so this seemed the appropriate costume choice. Hubby went with a Spinal Tap look. There was singing, loud, drunken and everything from amazingly good to truly terrible singing and I think I was responsible for rather more than my fair share of the latter. Among the songs I murdered (with help from friends, no solo performances for me!) were Khe Sanh, Jack & Diane, Paradise by the Dashboard Light, Just the Way You Are, American Pie, One Way Or Another, Summer of 69…I have a horrible feeling there were more but there were also many black russians so the memory is a little fuzzy! congratulations on two great losses- loving the playlist! sounds like you had a great time. You never realise how long Paradise by the Dashboard Lights is until you start singing it in public! You look sensational – how handy are corsets! !